The exhibition consists of over one hundred unique statues, prints of scroll paintings (thangkas) and ritual objects. The hand-picked exhibits of highest artistic quality represent the art of Tibet and Nepal. The objects come from private collectors, meditation centres and foundations. The exhibition will be shown in Krakow for the first time. It has travelled through several European cities, including London, Budapest, Innsbruck, Vienna, Regensburg, Bratislava and Brussels in the European Parliament. This exhibition offers a rare opportunity to experience the traditional art of Tibet and Nepal. The exhibited artworks are rooted in the centuries-old spiritual tradition of Tibetan Buddhism, which today not only continues to be practiced in the East, but has also begun to flourish in the West. The art of making buddhist statues and scroll paintings has been handed down from master to disciple for centuries. These works can be valued and enjoyed on the level of outer aesthetic - and the exhibition&apos;s subtitle referes to this level. They&apos;re intricately crafted and compliant with all the iconographic and iconometric requirements of the centuries-old Vajrayana Buddhist tradition. Although the exhibits can be admired for their artistic merit and enjoyed on the level of external aesthetics - and the exhibition&apos;s subtitle refers to this aspect - the real value of these works lies in their deep symbolic importance for those practicing Diamond Way (Vajrayana) Buddhism. Tibetan Buddhist art is closely linked to the teachings on the nature of the mind and the path of meditation, leading to enlightenment: the full realization of the potential of one&apos;s mind. The statues and painted images of buddhas, rather than portraying deities to be worshiped, are understood to be like mirrors which reflect the richness of the fully realized mind, or in other words, our own Buddha nature. 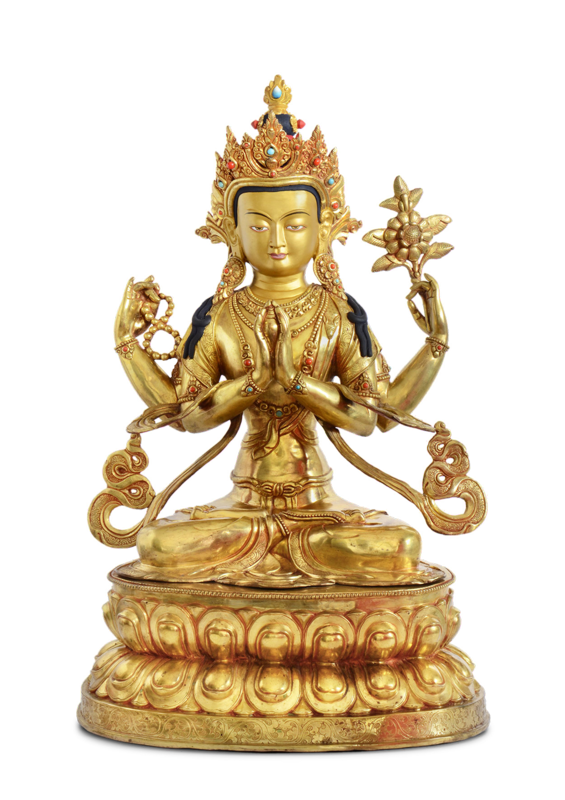 These objects help to develop personal qualities such as fearlessness, unconditioned joy and active compassion. By focusing on the buddha forms during meditation, the practitioner receives feedback in their mind, through which these enlightened qualities are accomplished more and more. Defined iconographic requirements of form and perfect proportions are preconditions for use in meditation. The expression, position of body, and displayed attributes express different facets of enlightened qualities. As well as the meditation instructions, the art of making statues and scroll paintings has been handed down from master to disciple for centuries. The exhibition’s basic theme is the so-called Refuge Tree (Skt. Punyaksetra, Tib. Tsog shing), which is a condensed representation of the Buddhist refuge. Refuge literally means ‘protection’, i.e. protection from the suffering of conditioned existence. The act of taking refuge means turning oneself towards timeless values and adopting them as the goal and the way. All Buddhists take refuge in the Three Jewels: the Buddha, showing the aim; the Dharma, the teachings; and the Sangha, the practitioners. Additionally, practitioners of Diamond Way Buddhism take refuge in the Three Roots - the Lama, the Yidams and the Protectors. The Lama, or Teacher, is the root of blessing and establishes a connection to enlightenment by transmitting students their experience of the nature of mind. The Yidams are the root of accomplishment, i.e. the personal meditation aspects that awaken certain qualities of the enlightened mind. The Protectors of the teachings are the root of beneficial activity. They remove outer and inner obstacles on the way. Ultimately, refuge is taken in the perfect qualities of mind. Even though the Refuge Tree can depict all lineage masters of each of the particular Tibetan Buddhist schools, in this case it shows the Kagyu Lineage, the Indian and Tibetan masters of the ‘Great Seal’ (Skt. Mahamudra) teachings given by the Buddha. The Refuge Tree itself is a wish-fulfilling tree. According to mythology, such a tree can be found in the God’s realm and in the Pure Land of Great Bliss (Tib. Dewachen) of the Buddha of Limitless Light (Skt. Amitabha). In the presence of such a tree, all wishes for enlightenment are spontaneously fulfilled. The enlightened nature of mind is embodied by Diamond Holder (Skt. Vajradhara, Tib. Dorje Chang), a large blue form that sits in the center of the Refuge Tree, at the point where the trunk of the tree divides into four branches. Dorje Chang in this central position represents the teacher (Skt. guru, Tib. Lama). He enables the students to establish contact with enlightenment. On top of the tree, the Lama appears as the tantric manifestation of Buddha Shakyamuni, origin of all transmission lineages of the Diamond Way (Skt. Vajrayana). Diamond Holder is surrounded by the Lamas of the transmission lineage. In front of them are the Yidams (representing our enlightened qualities), to their right appear the Buddhas, behind them there is the Dharma (the teachings), on the left is the Sangha (the community of realized practitioners&apos;). Below the Yidams are the Dharma Protectors. Buddha refers to the historical Buddha Shakyamuni, who was born in today’s Nepal around 560 B.C. He attained enlightenment in Bodhgaya, India, gave teachings and acted as an example for all practitioners. He represents the enlightened state of mind, which can be imagined as the full awakening from the sleep of ignorance, the removing of all mind&apos;s veils, and the accomplishment of one&apos;s potentially innate wisdom. There are different Buddha forms in the Refuge Tree, belonging to the past, present and future, and they can be seen on the right hand side of Diamond Holder. 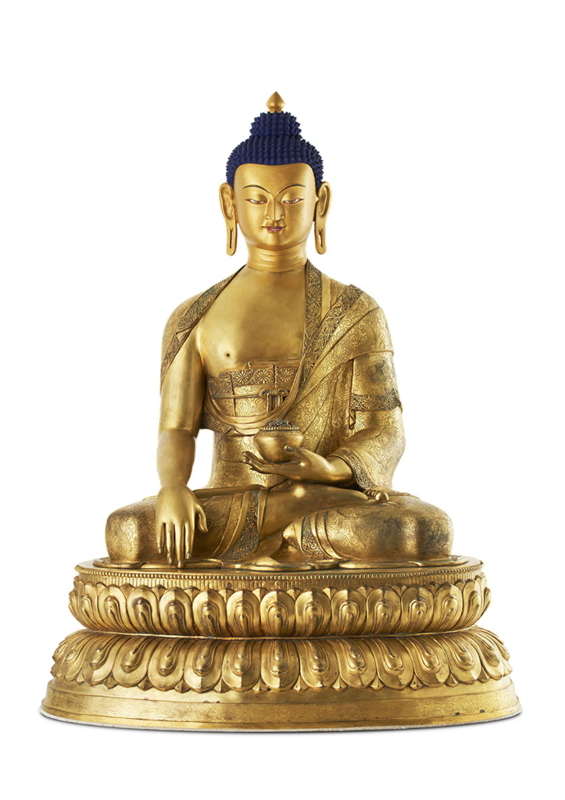 Other forms belonging to this group are Medicine Buddha (Skt. Bhaisajyaguru) and the Buddha of Limitless Light (Skt. Amitabha).They remind us of our buddha nature, which is inherent in all sentient beings. The Dharma refers to the teachings of the Buddha, which are about the nature of phenomena and the way to enlightenment, as written down in the Buddhist Sutras and Tantras. These contain philosophical and practical explanations, as well as psychological tools which support our development. Buddha Shakyamuni gave 84 000 guidelines within three teaching cycles. These guidelines meet the various levels and needs of the students. 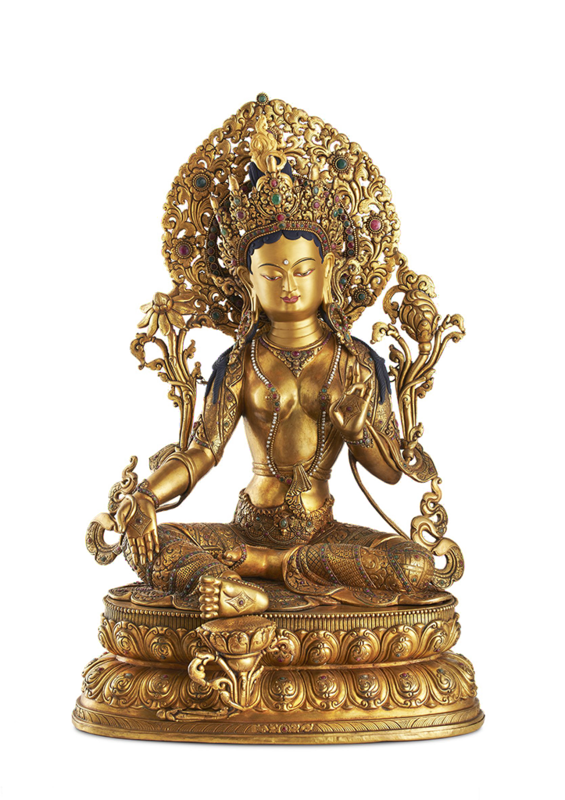 Dharma is depicted as a collection of books, or as a female golden Buddha form (Skt. Prajnaparamita, Tib. Yum Chenmo), symbolizing the wisdom of the teachings. She is situated behind Dorje Chang on top of a library, or above the Tree. Firstly, the Sangha refers to the community of realized practitioners (the Noble Sangha), who know the methods and the goal of the way and help others to accomplish it. Secondly, the Sangha refers to the group of people who practice together and help each other on the way to enlightenment (the ordinary Sangha). In the Refuge Tree we only find the first type. Bodhisattvas belong to the Noble Sangha. They are consciously reborn in order to help others. They are companions on the way for all practitioners and manifest themselves in numerous ways. In the Refuge Tree they are represented by forms on the left of Dorje Chang. The three main Bodhisattvas are Loving Eyes (Skt. Avalokiteśvara, Tib. Chenrezig), Wisdom Buddha (Skt. Mañjuśrῑ, Tib. Jampel yang) and Diamond in Hand (Skt. Vajrapāṇi, Tib. Channa Dorje). 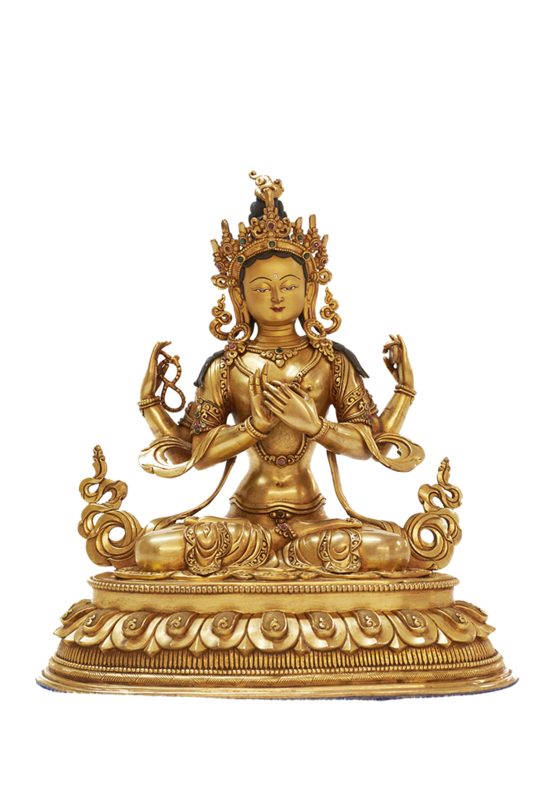 They express the compassion, wisdom and power of all the present, past and future Buddhas. The teacher is called the Lama in Tibetan. In Diamond Way, he or she is the source of blessing and the direct connection to enlightenment. The Lama embodies the full development of the mind. He/she manifests as the Buddha, his/her teachings are the Dharma, and his/her (physical) form embodies the Sangha. For that reason the Lama is the central figure in the Refuge Tree. In the Kagyu Lineage the Lama is represented by Diamond Holder (Skt. Vajradhara, Tib. Dorje Chang), a blue form of energy and light. Here the condensed refuge is taken in the timeless qualities of the Lama. The Yidams are aspects of the Buddha, and they embody all the perfect qualities of mind. They enable a practitioner to connect with his or her enlightened nature. When meditating on the Yidams, the practitioner develops many useful skills and qualities. The Yidams can take various forms: female or male, single and united, peaceful and powerfully protecting. Every aspect of these forms, such as color, position, expression and attributes shows various facets of the enlightened qualities of the practitioner&apos;s mind. The main Yidams of the Karma Kagyu tradition shown in the Refuge Tree are Highest Bliss (Skt. Cakrasaṃvara, Tib. Khorlo Demchog,) and Red Wisdom (Skt. Vajravarahi, Tib. Dorje Phagmo). 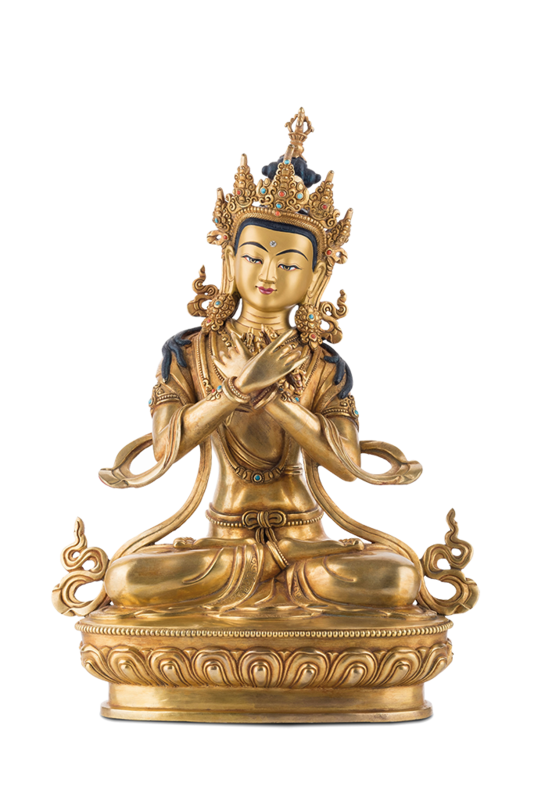 The Protectors are the Buddha aspects with the special quality of removing inner and outer obstacles on the way to enlightenment. In the Refuge Tree they can be seen below the Yidams. The flames surrounding the Protectors symbolize their compassion expressed by their powerful activity. A wisdom eye on the forehead distinguishes them from demons and harmful energies. Similarly to the Yidams, the Protectors&apos; activity is not different from the activity of the Lamas. In the Karma Kagyu tradition the main Protectors are Black Coat (Skt. Vajra Mahākāla, Tib. Bernagchen) and Radiant Goddess (Skt. Shri Devi, Tib. Palden Lhamo). The roots of the Tibetan manufacturing of statues goes back to Indian models, which are based on descriptions of Buddha’s outer appearance in Buddhist meditation instructions (Skt. sādhana). 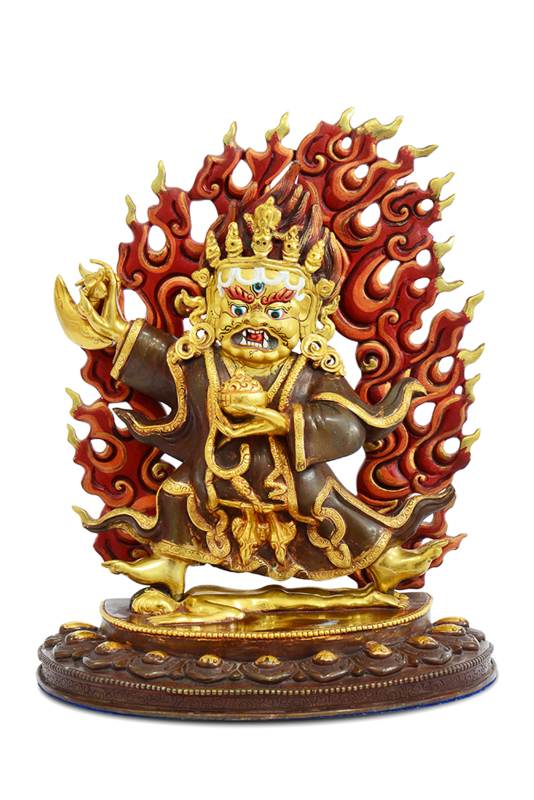 Tibetan sculptors cast their statues by alloying various metals, including bronze and copper. It was common to cast wax and beat metal, i.e. to hammer and shape the forms. Most of the smaller statues were cast according to the method of the "lost form". The raw form is refined until it has its final shape. The general artistic impression is mainly dependent on the final precision work and the polishing, engraving, painting and inlaying with precious materials or stones. Many statues are gilded. Often it took the artists more than five years to produce only one of the statues or thangkas. Before being used for meditation, the statues are filled with relics, mantra-rolls and other special ingredients. During the final consecration ceremony (Tib. rab gnas) the buddhas are invited to take residence inside the statue, and from this moment on the statue is seen as a representation of the buddhas themselves. Along with statues thangkas (scroll painting on canvas) are supportive element of meditation practice – they depict buddhas, buddha aspects, life stories of meditation masters, transmission lineages or mandalas (power fields). Most of the compositions seen on thangkas are specified by Buddhist iconography. The painters must also comply with measurements and proportions established in certain Buddhist scriptures. The process of creating a thangka consists of 6 clearly defined steps: preparing the painting surface, sketching the design on the prepared surface, laying down initial coats of paint, shading, outlining, finishing touches. The last stage includes burnishing golden elements, painting faces and “eye opening”, which is a part of a thankgka’s consecration ceremony (Tib. rab gnas).